Good morning, and happy Monday. It’s Beatrice, and I’m back on the blog again to inspire you with two mix and match collections by SnickerdoodleDesigns. First Mix and Match Edges Collection which I’ve featured on the blog previously. Make sure you check out the tutorial Karen has written on ways to use the edges: New Mix and Match Edges Tutorial. Personally I like to use these edges as borders on a page to add just a little extra texture and polish to my layout. judy in SD created this gorgeous art journal page, Enjoy the Sun, using the Halftone Edges. Credits also include Essence of Life 1 by Christine Art and word art by Brandy Murray. The vertical composition, including the hand-drawn flowers, is enhanced by the trail of butterflies and perfectly reinforced by the vertical word art. The palette is lovely, and the Halftone Edges draw the eye into the layout. Norma uses the Handwritten Edges in this adorable layout, titled Bunny Love. She chose the perfect collection to showcase her photos: You Are a Masterpiece, also by SnickerdoodleDesigns. She actually manipulated the edges by duplicating and changing blend modes to make them work for her layout. The beautiful clusters in opposing corners and the large title across the top create a visual triangle, a perfect example of one design principle. The little boy doll peeking right at the photos is a clever touch. I love the way the larger photo is masked and spills out of the frame. Zurich by Bright Eyes uses the Newsprint Edges as well as The Scenic Route Collection, also by SnickerdoodleDesigns. I love the blended background papers, especially the faint outline of the buildings. The edge is recolored to match perfectly. The stacking of the photos and elements placed behind are arranged to focus on the photos from their trip. I really like the way the swirl mimics the flight of the butterfly and the title work is very creative. Father’s Day by Glori uses the Inked Edges and another Snickerdoodle Collection, Serendipity. The template she chose is by JoCee Designs. She uses the template in a unique way by masking and dividing a single photo. The stitched banner in the corner is a delightful touch, and the flower cluster, as well as the flowers and leaves scattered about the layout, contrast beautifully with the blue background. The yellow of the inked edge borders the layout and mimics the colors of the flowers. The navigational element placed at the edges of the page supports her boating theme. The second mix and match collection I’d like to feature is Mix and Match Edge Overlays. There are four individual sets as well as two sets of duos which I’m showing you below. Karen has created a tutorial, Stretching Your Digi-Stash Using Layer Masks. This tutorial features the Mix and Match Edge Overlays and demonstrates how you can combine them with papers already in your stash to create an endless and varying supply of coordinated papers. The sample papers in the product images above show just how easily you can make gorgeous papers of your own. 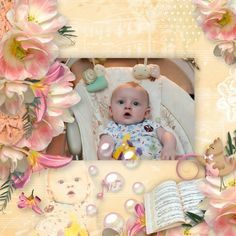 Kabra uses Mix and Match Edge Overlay Set 1, as well as the Good Friends Collection in this darling layout, Sweetness, featuring her granddaughter. The paper she created is so pretty. I love the subtle floral drawings in the left hand corner moving down the edge of the page. The edges give a delicate, almost glittery, look to the page. The large floral clusters atop the circular framed photo are lovely. I’m guessing she created the bottom border by repeating one of the tags included in the collection, such a creative way to use a kit element. The font she chose for her title matches her theme perfectly. Finally, Kabra uses the Mix and Match Edge Overlay Set 2 and the Nature Hike Collection in Patience. 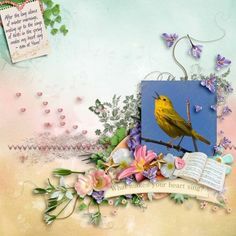 She also uses the coordinating Nature Hike Freebie by SnickerdoodleDesigns for the Use-it-All Challenge at The Digichick. I really like the stacked papers and the way she divided the top paper, then framed it with one of the edge overlays. 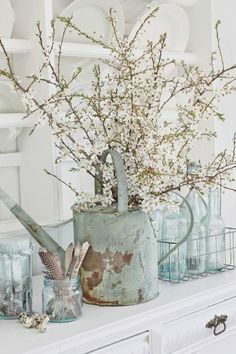 The large cluster placed on top of the frame is gorgeous, and the single leaf placed opposite is very effective. She added the word art from the freebie in just the right spot, where it serves as both title and journaling for her layout. I hope you have been inspired by the layouts in today’s post to create some of your own unique papers using either or both of these products, which can be combined in so many ways. Have a great week and I’m looking forward to seeing your gorgeous layouts.